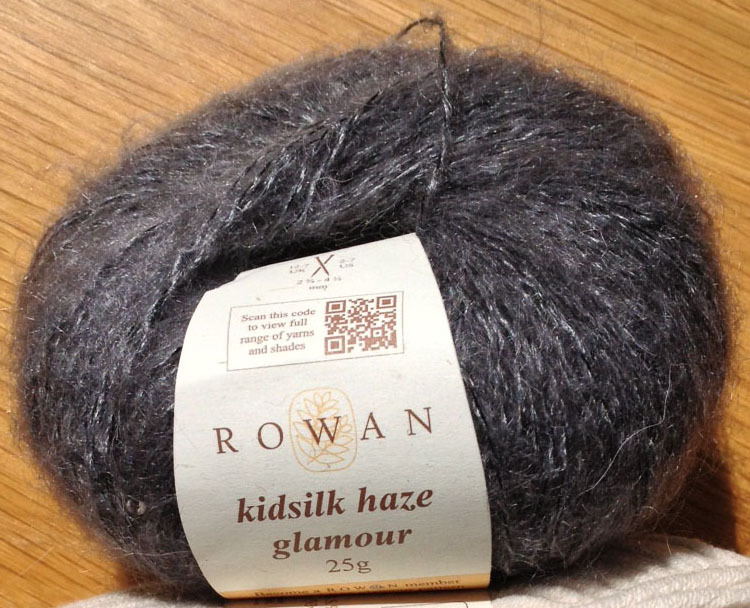 Kidsilk Haze Glamour is the latest yarn to be added to the very popular Kidsilk Haze family and, having received a ball in a lovely grey colour called Smoke from Rowan, I was keen to make something befitting its exquisite qualities. As you can see from the picture on the left, it is a very luxuri ous yarn scattered with delicate sequins and with this in mind I decided to make a small shoulder-covering shawlette with my one ball adding some Kidsilk Haze from my stash. I often design as I knit and started off in a couple of wrong directions but finally ended up with this. 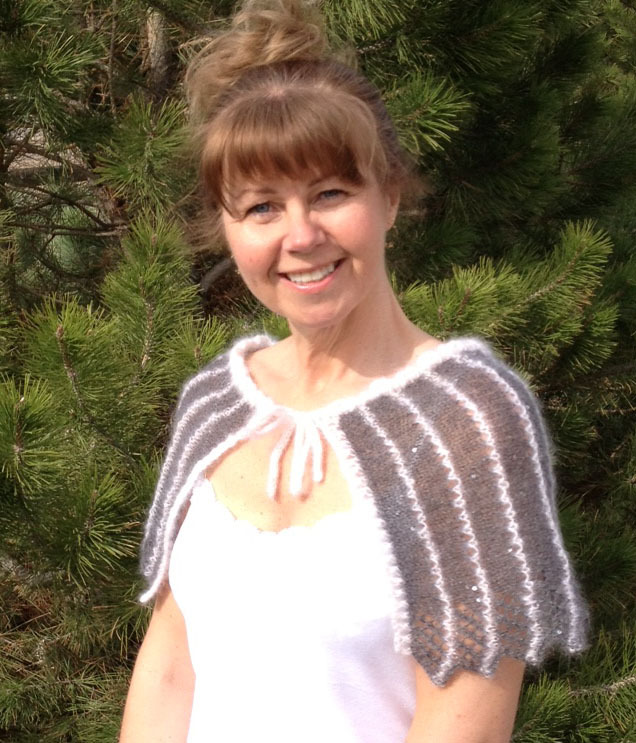 My finished shoulder-covering shawlette is delicately soft and light and will be just enough to keep the chill off my shoulders if a hot summer’s day turns into a cool evening. 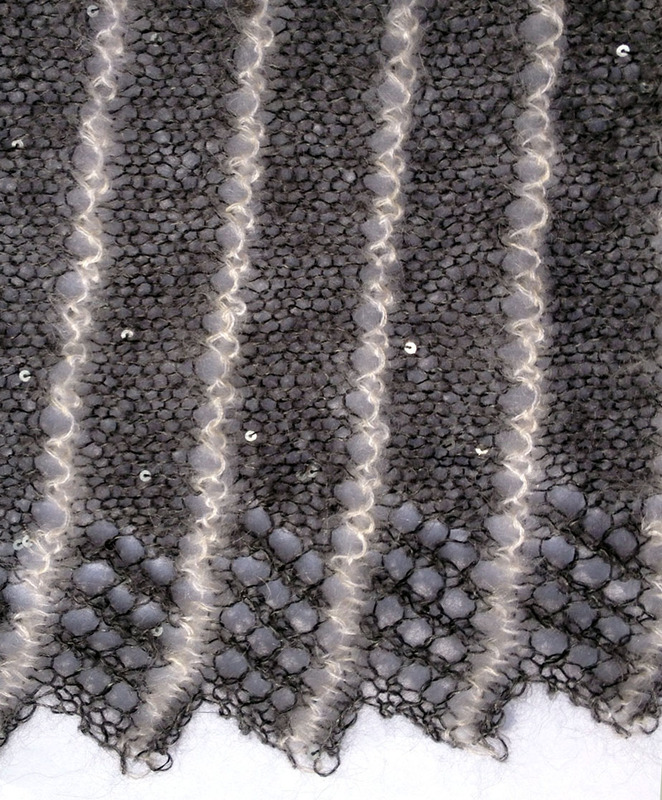 This yarn never seems to disappoint; everything I knit with Kidsilk Haze turns out so very beautiful and elegant! Now I can say the same for Kidsilk Haze Glamour and with added sparkle! It is also very soft on the skin and there is no shedding of fibres like you can get with angora. The pattern itself is very simple and took one full ball of Kidsilk Haze Glamour in Smoke (25g) and 15g of Kidsilk Haze in cream, worked double, so you would need 40g in total. It’s easy to increase the length of the shawl if you wish or you could knit it in one colour which will make it a really quick project as there will be no weaving in ends to finish it off. Kidsilk Haze Glamo ur comes in 8 different shades and Kidsilk Haze comes in an incredible 36 different shades! So if you have never tried this yarn all you need is 2 balls…but I warn you …..you will be back for more! 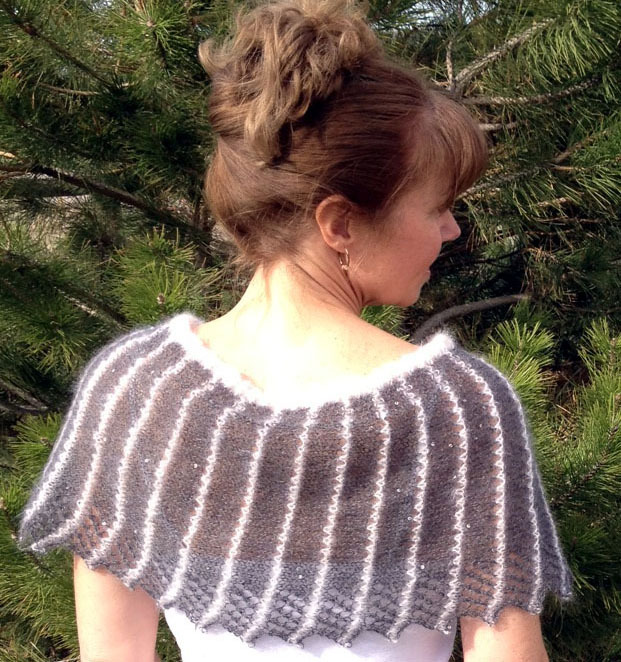 If you would like a copy of my Shimmering Shoulder Shawlette pattern it is available on Ravelry along with my other designs. Also, Rowan has many free patterns on their website available to their members which is free to join. This months member’s exclusive free pattern is the Gypsy Shawl, pictured right, designed by Sarah Hatton using Kidsilk Haze Glamour. If you would like to become a Rowan member please register with Rowan and then you will be able to download this free pattern!